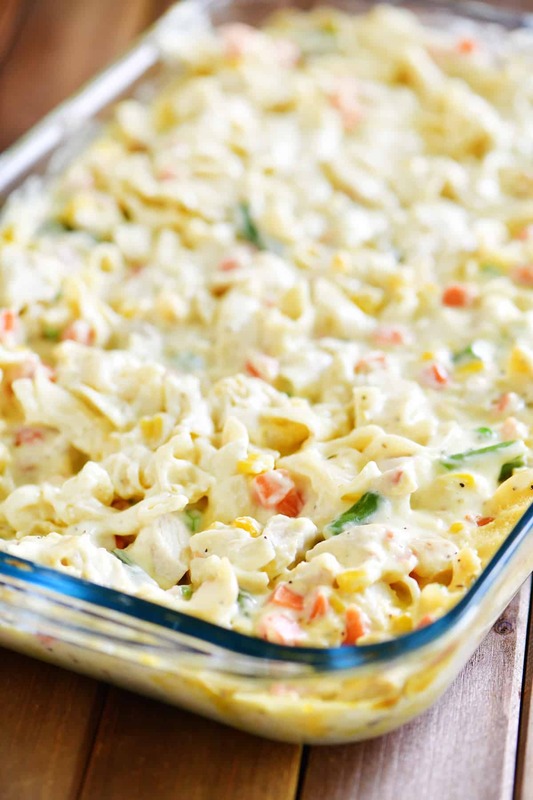 Chicken Noodle Soup Casserole is comfort food at its best! 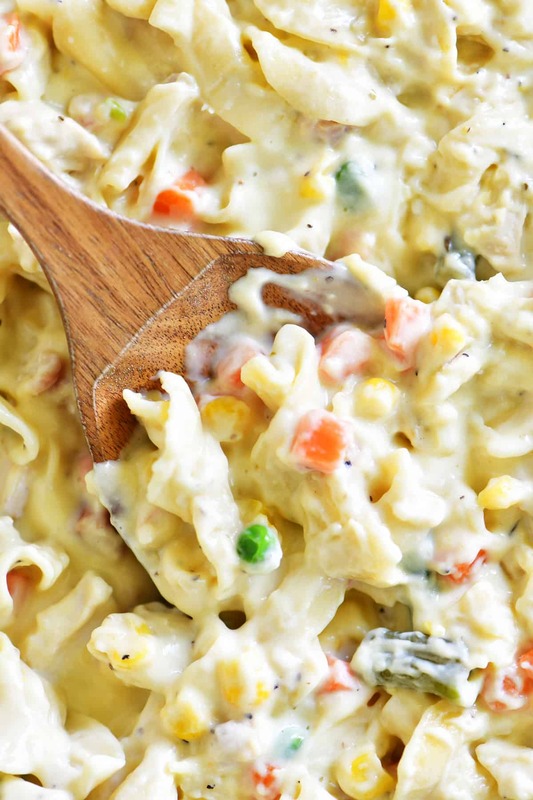 A warm, creamy combination of noodles, soup, chicken, and vegetables perfect for family dinners. Along with the cool fall nights, comes the need to gather family and friends around the table for a comforting family dinner. Growing up in Minnesota, this would’ve been called Chicken Noodle Soup Hotdish instead of casserole. A hotdish is a casserole with a meat, starch, vegetables, and a cream soup. 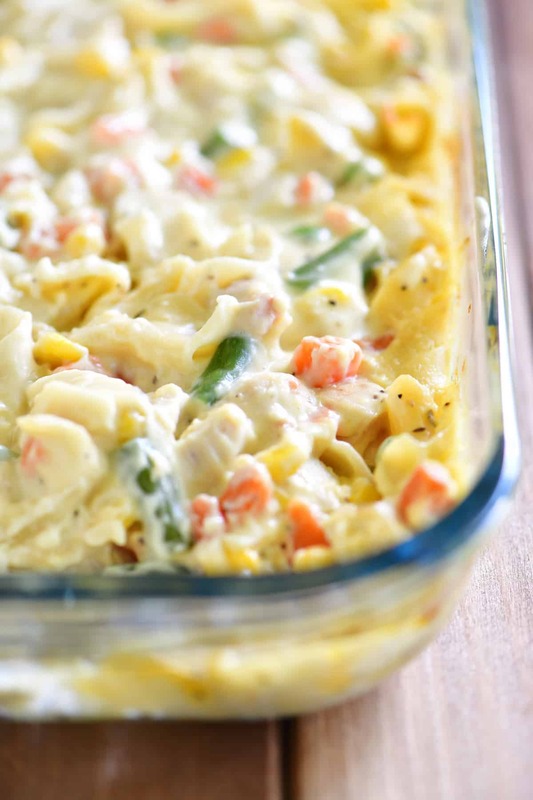 No matter what you call it this casserole it is sure to become a favorite! 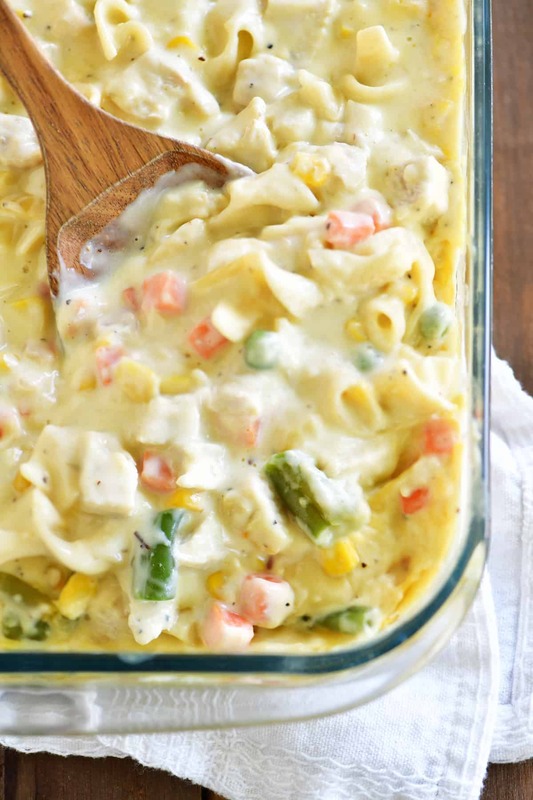 Where is the Chicken Noodle Soup Casserole Recipe? In this post, I will share step-by-step instructions with photos for how to make the casserole, as well as answering FAQs about the recipe, giving suggestions for more chicken recipes and showing a video of the recipe. But you can go directly to the recipe by scrolling down to the bottom of the post. 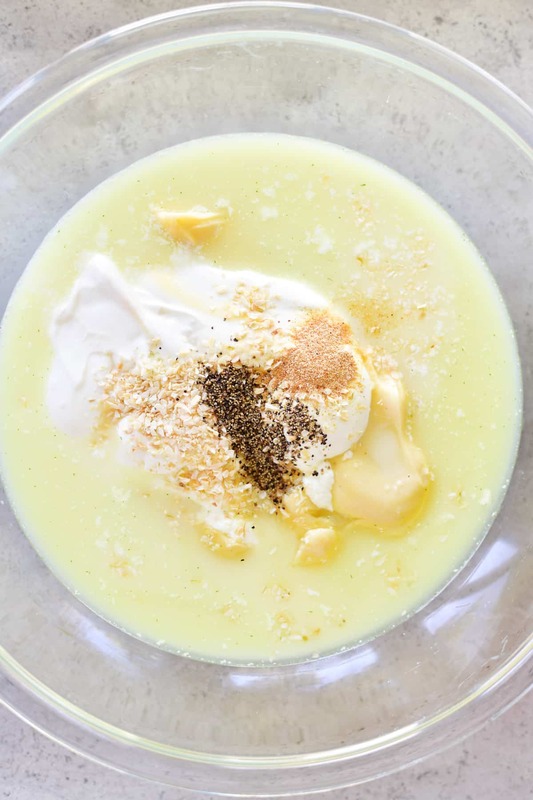 Whisk together condensed cream of chicken soup, sour cream, milk, chicken broth, minced onion, garlic powder, and black pepper. 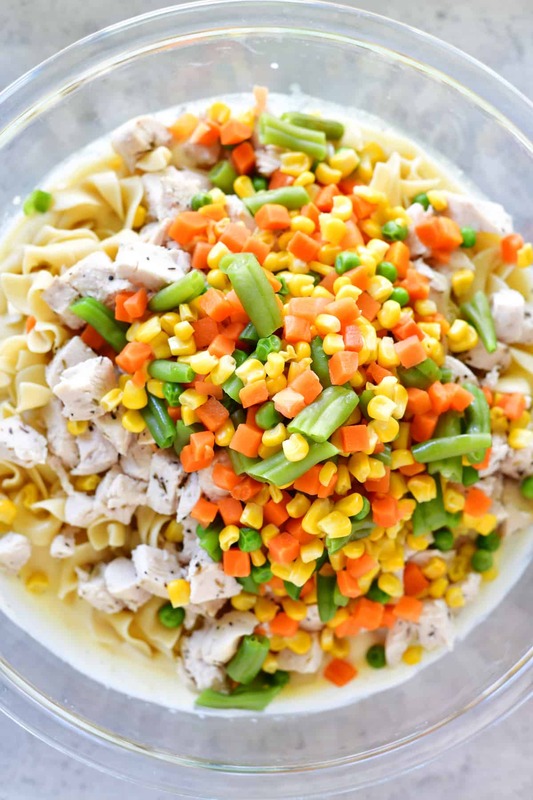 Add cooked extra-wide egg noodles, cooked chicken, and mixed vegetables. Spread in a 9×13 inch pan. Bake at 375˚F for 25-30 minutes, until bubbly and hot. 1. 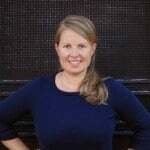 Can I replace the extra-wide egg noodles with other noodles? Yes! Choose three cups of your favorite noodles instead. 2. We’ve got picky eaters. Can this recipe be made without the vegetables? Yes, just skip them and follow the rest of the recipe. 3. 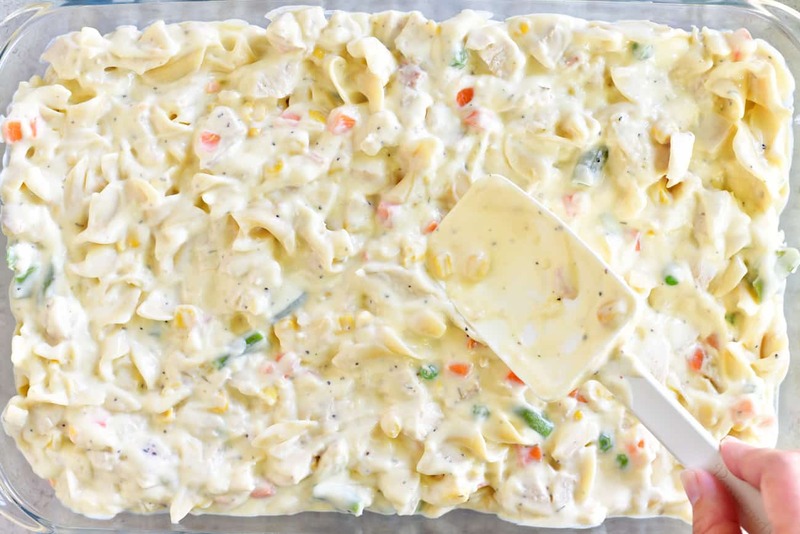 How can I make gluten free chicken noodle soup casserole? Replace the items with gluten in the recipe with gluten free versions. Here is some gluten free pasta, gluten free condensed cream of chicken soup and gluten free chicken broth. 4. Can I make this ahead of time? Yes, follow the steps and stop after spreading it in the pan. Cover and refrigerate overnight. Place on the counter while the oven is preheating. Bake as usual. It may take 5-10 minutes longer to get hot so allow a little extra time. 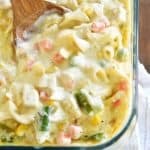 One Pan Cheesy Chicken Noodles: This One Pan Cheesy Chicken Noodles recipe is an easy family dinner idea. It’s warm, it’s cheesy and it cooks in about 15 minutes! Slow Cooker Chicken Pot Pie Soup: This crockpot recipe for Slow Cooker Chicken Pot Pie Soup is hearty dinner idea for chilly nights. Serve with puff pastry breadsticks instead of pie crust! Tater Tot Chicken Pot Pie: Tater Tot Chicken Pot Pie because admit it…pie crust is boring. The whole family will love this spin on the traditional chicken pot pie recipe. Add cooked extra-wide egg noodles, cooked chicken, and mixed vegetables. Gently stir until coated. Can you leave out the sour cream?? Yes, you can leave out the sour cream but you’ll need to replace it with something else or the casserole will be too dry. You could mix in more milk…maybe 1/2 cup?